Matt Hagan drove to his third Funny Car pole of the season Saturday at the 11th annual Summit Racing Equipment NHRA Nationals at Summit Racing Equipment Motorsports Park in Norwalk, Ohio. Doug Kalitta (Top Fuel), Greg Anderson (Pro Stock) and Matt Smith (Pro Stock Motorcycle) were also No. 1 qualifiers in their respective categories at the twelfth of 24 events on the 2017 NHRA Mello Yello Drag Racing Series schedule. Hagan secured the top spot after setting the track elapsed-time record with a pass of 3.865-seconds at 333.33 during the second session Friday night. Kalitta maintained his advantage atop the Top Fuel category with an elapsed time track record run of 3.709-second pass at 327.43 mph during the second session on Friday night, earning his first pole on the year and 48th of his career. Kalitta is now tied for 15th in NHRA history with Antron Brown as each of the active Top Fuel drivers have 48 career poles to their credit. Brittany Force secured the number two slot after a 3.714 pass at 327.66 during her second run on Friday night. Points leader Steve Torrence qualified third with a run of 3.715 at 328.46 as he chases his fourth win of the season. In Pro Stock, Anderson held on to the top spot after driving to a 6.584 at 210.24 pass during the fourth and final session on Saturday. Points leader Bo Butner qualified second with a 6.588 at 210.41 in his Jim Butner’s Auto Chevy Camaro. Drew Skillman locked in the third spot after a 6.593 at 209.92 in his Ray Skillman Chevrolet Camaro. Smith rode to the pole in Pro Stock Motorcycle with a run of 6.824 at 196.16 in his Victory Polaris Magnum during his third qualifying run. He was able to lock down his 25th career No. 1 qualifier and first of the season. Eliminations at the 11th annual Summit Racing Equipment NHRA Nationals begins at 11:00 a.m.on Sunday at Summit Racing Equipment Motorsports Park. NORWALK, Ohio – Sunday’s first-round pairings for eliminations for the 11th annual Summit Racing Equipment NHRA Nationals at Summit Racing Equipment Motorsports Park, the 12th of 24 events in the NHRA Mello Yello Drag Racing Series. Pairings based on results in qualifying, which ended Saturday. DNQs listed below pairings. Top Fuel — 1. Doug Kalitta, 3.709 seconds, 327.43 mph vs. 16. Troy Buff, 3.972, 284.33; 2. Brittany Force, 3.714, 327.66 vs. 15. Pat Dakin, 3.912, 313.95; 3. Steve Torrence, 3.715, 328.46 vs. 14. Troy Coughlin Jr., 3.894, 313.37; 4. Leah Pritchett, 3.720, 323.81 vs. 13. Ike Maier, 3.880, 298.47; 5. Antron Brown, 3.736, 332.26 vs. 12. Dom Lagana, 3.851, 320.51; 6. Clay Millican, 3.741, 324.51 vs. 11. Scott Palmer, 3.828, 319.14; 7. Terry McMillen, 3.750, 323.35 vs. 10. Shawn Langdon, 3.799, 320.66; 8. Tony Schumacher, 3.766, 328.38 vs. 9. Mike Salinas, 3.792, 315.71. Did Not Qualify: 17. Chris Karamesines, 4.065, 276.13; 18. Luigi Novelli, 4.429, 186.07. Funny Car — 1. Matt Hagan, Dodge Charger, 3.865, 333.33 vs. 16. Jeff Diehl, Toyota Solara, 4.561, 201.40; 2. Robert Hight, Chevy Camaro, 3.870, 334.65 vs. 15. Jim Campbell, Charger, 4.092, 310.91; 3. John Force, Camaro, 3.911, 319.98 vs. 14. Dale Creasy Jr., Charger, 4.076, 306.46; 4. Jonnie Lindberg, Toyota Camry, 3.922, 323.89 vs. 13. 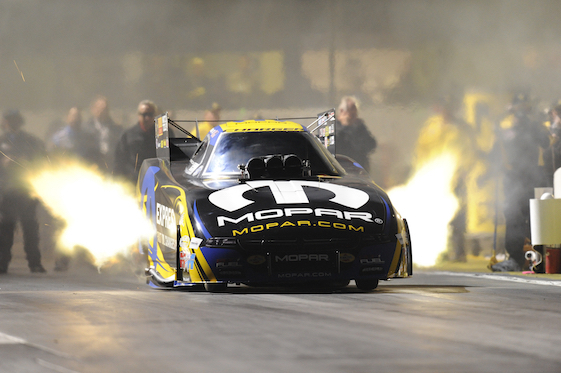 Ron Capps, Charger, 4.018, 321.19; 5. Tommy Johnson Jr., Charger, 3.925, 329.34 vs. 12. J.R. Todd, Camry, 4.002, 320.89; 6. Bob Tasca III, Ford Mustang, 3.930, 324.67 vs. 11. Tim Wilkerson, Mustang, 3.991, 322.65; 7. Alexis DeJoria, Camry, 3.943, 320.13 vs. 10. Del Worsham, Camry, 3.982, 317.05; 8. Cruz Pedregon, Camry, 3.962, 328.22 vs. 9. Jack Beckman, Charger, 3.971, 322.04. Did Not Qualify: 17. Courtney Force, 4.627, 194.41. Pro Stock — 1. Greg Anderson, Chevy Camaro, 6.584, 210.24 vs. 16. Mark Hogan, Pontiac GXP, 6.862, 202.24; 2. Bo Butner, Camaro, 6.588, 210.41 vs. 15. Val Smeland, Camaro, 6.792, 202.03; 3. Drew Skillman, Camaro, 6.593, 209.92 vs. 14. John Gaydosh Jr, Chevrolet Camaro, 6.704, 206.57; 4. Tanner Gray, Camaro, 6.593, 209.07 vs. 13. Kenny Delco, Camaro, 6.703, 206.86; 5. Jason Line, Camaro, 6.594, 210.24 vs. 12. Alan Prusiensky, Dodge Dart, 6.668, 206.73; 6. Jeg Coughlin, Camaro, 6.610, 209.49 vs. 11. Alex Laughlin, Camaro, 6.632, 209.33; 7. Vincent Nobile, Camaro, 6.616, 210.01 vs. 10. Erica Enders, Camaro, 6.623, 210.47; 8. Chris McGaha, Camaro, 6.619, 209.49 vs. 9. Allen Johnson, Dart, 6.619, 208.91. Pro Stock Motorcycle — 1. Matt Smith, Victory, 6.824, 196.16 vs. 16. Joe DeSantis, Suzuki, 7.056, 189.68; 2. LE Tonglet, Suzuki, 6.847, 195.36 vs. 15. Melissa Surber, Buell, 7.018, 192.41; 3. Hector Arana Jr, Buell, 6.886, 194.63 vs. 14. Karen Stoffer, Suzuki, 6.958, 193.29; 4. Joey Gladstone, Suzuki, 6.904, 193.65 vs. 13. Eddie Krawiec, Harley-Davidson, 6.952, 192.28; 5. Scotty Pollacheck, Suzuki, 6.908, 193.60 vs. 12. Angelle Sampey, Victory, 6.943, 192.74; 6. Andrew Hines, Harley-Davidson, 6.916, 193.79 vs. 11. Angie Smith, Buell, 6.940, 192.25; 7. Chip Ellis, Buell, 6.929, 193.46 vs. 10. Steve Johnson, Suzuki, 6.937, 193.18; 8. Mike Berry, Buell, 6.932, 192.03 vs. 9. Cory Reed, Victory, 6.932, 191.13. Did Not Qualify: 17. Michael Ray, 7.164, 177.00; 18. Odolph Daniels, 7.624, 171.34.